November is National Family Caregivers month—a wonderful opportunity to recognize and to honor family caregivers. It’s also a time to remember that caring for our loved ones can be quite stressful physically, emotionally, psychosocially, financially, and spiritually. Consequently the theme this year, Take Care to Give Care, is certainly apropos. Although I have always highly revered family caregivers, my experience with a family member over the past week served to further enhance my admiration of caring companions. As noted in previous postings, I have cared for numerous family members and friends over the course of my lifetime. I have served as a professional caregiver, written a book about caregiving, and currently present educational programs on various aspects of caregiving throughout the nation. However, being knee-deep in the caregiving process once again this past week reinforced my appreciation of and commitment to family caregivers. Caregiving is a sacred demanding, exhausting, frustrating, time-consuming, daunting, emotional, life-giving, humorous, inspired, frightening, loving, compassionate, multi-faceted journey…to say the very least! My re-enlistment as a family caregiver is the result of an accident. One afternoon last week upon returning from my daily walk in the neighborhood, I noticed my precious pup—Millie—frantically pawing her face. Somehow, Millie had severely injured her eye. So off to the vet we flew! Upon examination, the vet determined a severe ulceration of the cornea (70% of the cornea). The exact cause of the injury is yet to be determine. More than likely, she tangled with a bush or tree in the backyard while in pursuit of a rabbit or mouse. Regardless, we were left to deal with the consequences of that adventure. In order to appreciate my angst, you must realize that my furry companions are my family. Dogs and cats have been and will continue to be my constant companions in life. We have a special, eternal bond that enriches my life. So, when my critters hurt, I hurt! After returning home, I created a spreadsheet to track the various medications prescribed by the vet. I knew my memory would not serve me well after a few days. Three medications administered at different times and in different amounts. Too much for a fatigued brain to remember accurately. Since Millie sleeps with me (“dog people” understand this), I was aware of her every movement. Due to the medication schedule and Millie’s obvious discomfort, neither one of us slept well the first few days. If you have been or are a caregiver, I am sure this scenario sounds all too familiar! As I glance around the house this morning, someone, something, or some other critter has been or is impacted by the consequences of Millie’s injury. Schedules have been readjusted. Furniture rearranged. Daily routines altered. It’s an adjustment for the entire household. Consequently, nothing seems normal—only because it’s not! The mandatory Elizabethan collar issued to Millie is symbolic of the abnormal state of affairs within our home. The collar is a hard, circular piece of plastic designed to inhibit dogs and cats from scratching and/or licking incisions, wounds, or injuries. We can’t risk Millie scratching her eye and exacerbating the injury. Although effective, Elizabethan collars are irritating! Millie’s turning radius increased by 300%. There is not a door frame in the house that is unscathed. The diameter of the collar disallows entrance into her beloved crate. And the cats think Millie is some sort of alien creature that has taken up residence in our home. But it’s not just about me and the other members of the family. I know Millie feels confined, restricted, and constrained by her new fashion accessory (and a wee bit embarrassed). Regardless, she has adapted well (better than the rest of us) to the new reality and is on the mend. A blessing indeed. Tomorrow, Millie and I return for our fourth (and hopefully final) visit with the vet. I am already imagining the joyous dance, wagging tail, and squeals of delight prompted by the removal of the pesky, plastic collar. No doubt, Millie will be happy as well. The past 10 days have been stressful for all concerned. But like my previous journeys of caregiving, the experience enhanced my appreciation and awareness of the many blessings in my life. Because of my recent caregiving experience, I am humbled by the loving care graciously offered by family caregivers—day in and day out. 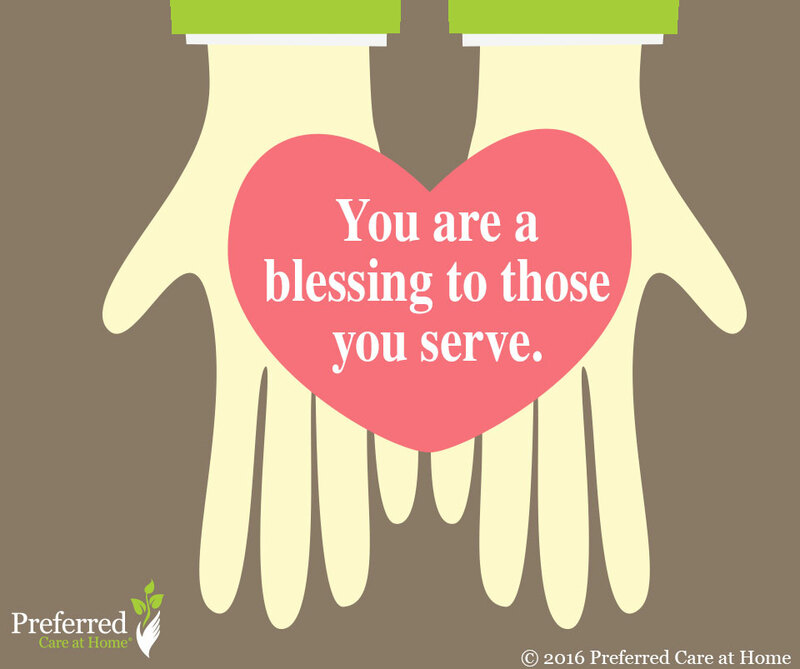 YOU are a blessing to those you serve. YOU are serving in sacred ways. So today, I recognize YOU. I honor YOU. I celebrate YOU. And I remind you—Take Care to Give Care.